Digital marketing is continually evolving. New technologies enhance your ability to collect information about your customers and how they view you. This cheat sheet provides you with advice you can immediately put into practice to engage your customers and track their opinions of you. Your staff works hard to make sure your company brand reflects its stated values. It’s not an easy job. Digital marketing tools like Google Alerts, Brand Watch Analytics, SentiOne’s social listening engine, Brand24, and Mention monitor the universe of content on the Internet and provide varying degrees of analysis and reporting features. Everything you present about your company, from website design to content to customer service gets rated and evaluated by customers and the industry at large. In the rough and tumble of social media, reviews, and ratings sites, consumers may write (fairly or unfairly) critical reviews of your products. They might complain about your services. Reputations can be damaged in an instant. You don’t have the luxury of ignoring these comments. You need to keep abreast of everything that’s said about your brand 24/7. Following are several tools that can help you stay on top of consumer comments. 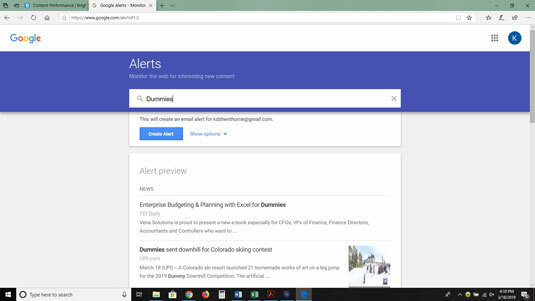 Google Alerts: This is a free, tried and true tool from Google. It lets you monitor company names, executive names, products, competitors, etc. When something new is written about any of your search terms it sends you an email. It’s so convenient that it’s worth using along with any other tools you choose. Brand Watch Analytics: This tool analyzes conversations across multiple social platforms and also alerts you to market trends. Brand24: Brand24 is a social media monitoring tool that focuses on providing the most complete information about your brand. They provide analytics and a sentiment score and send you alerts. 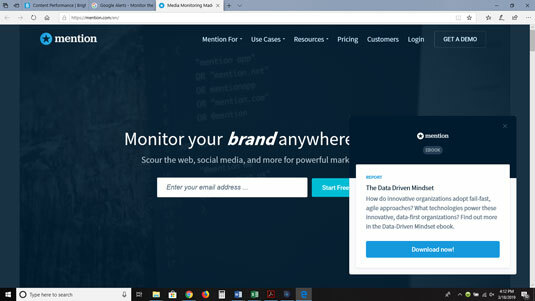 Mention: This tool has a useful dashboard interface that tracks social media, influencers and provides custom reports. No matter which tools you use, remember to refresh and update the keywords, hashtags, and other metrics you track. Such things as product names and content topics regularly change. Working with influencers is a hot topic right now; getting your audience to engage is getting harder and harder. More social platforms and more forms of content (video and podcasting, for example) are coming online every day competing for their attention. Have a ready-made audience of their own to meet you. If you’re trying to grow your audience getting exposure to a large like-minded group can fast-track your efforts. If you have chosen carefully, your influencer’s audience should mirror your own. Know what topics their audience responds to. Influencers know what subjects interest their audience and they can provide it. They can also supply you with some great ideas for your content. Create the kind of material their audience favors. Knowing what form of content (video, audio, and so) engages their audience helps you understand how to engage your audience more effectively. Confer social acceptance. One of the main reasons for working with influencers is that it tells your audience that you have value. Users can be reluctant to listen to a new voice. Their approval paves the way. Can become an ongoing partner. Communicating and working with influencers introduces you to new potential partners. If you find someone you like working with you can plan further collaborations to help grow your business. One of the greatest difficulties that most companies have is to continually create and refresh relevant content. When you’re just starting out as a content creator you can probably think of lots of ideas to get you through the first several months. But, after you’ve exhausted your supply, you need to find new ideas. Here are several tools that you should consider to help you research new topics to write about. 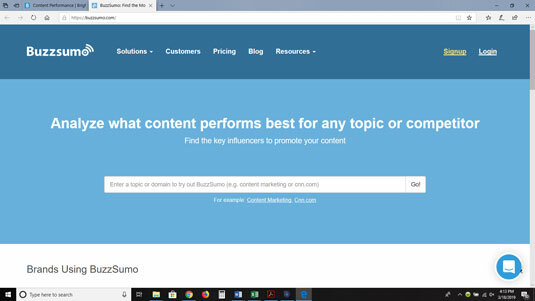 Buzzsumo: Buzzsumo is a multi-faceted content search tool that provides you with a variety of ways to search and find great topics. They have several plans that offer differing levels of analysis. You can discover influencers to see what topics are most popular on social media. 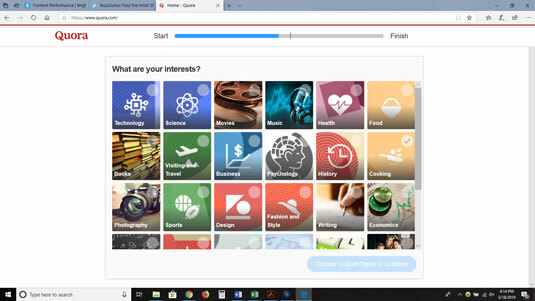 Social Animal: Social Animal is another robust content search tool that uses machine learning to help you find new content. You can find new influencers, see a list of popular keywords, and research your competitors. Quora: Searching Quora is a great way to find out what people are asking about your topic online. Use the search box at the top to type your subject and choose Answers in the By Type list on the left. Ubersuggest: Ubersuggest is a free tool that allows you to search keywords and domains. You can search keyword ideas, find the most shared content, and analyze traffic for them. Content Studio: Content Studio helps you discover content and also connect with your social media accounts to update keyword searches. You can compose blog posts from within the tool and automate your posting. You can sign up for a free plan to try out its platform. It cuts through the noise. Any email your company sends lands right in your customer’s inbox and they are more likely to read it if it interests them. If someone has given you their email address, it’s likely that they have some affinity for your message, so you narrow the odds that they will ignore you. You also increase the odds that you can develop a relationship with your brand. It’s not hit or miss like social media. When you use social media to communicate you have the potential to reach billions of people. The problem with using it is that unless users are actively looking for updates from you, they could miss your message. You can monetize them. Sending emails that offer products or services is an accepted way to sell. As long as you don’t abuse the privilege, users will consider your offers. By tracking who buys from these emails you can determine their return on investment (ROI). This is much more difficult to track on social media.